It should not be surprising that many figures of mid-twentieth century Kansas should have had some military experience in World War I. Perhaps it is surprising how little experience some had. 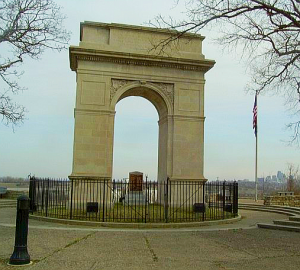 The Rosedale Arch is one monument that has a nice location, one that has a great view of the Kansas City skyline. It can also be seen from I-35, the 35th Division Memorial Highway, and probably more so now that the leaves are falling from the trees. The US World War One Centennial Commission has released a video and a radio PSA for use in promoting the Countdown to Veteran’s Day. Since 1908 . . . The intent of this post is to have a little fun, but I run the risk of alienating Chicago Cubs’ fans . 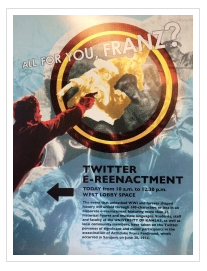 . .
Efforts are continuing, through the United States World War One Centennial Commission, to establish a WWI memorial in Washington, D.C. This effort will expand and update the existing memorial to John J. Pershing to an all-encompassing war memorial.